Have you ever spent time with a person and just felt emotionally and mentally exhausted afterwards? Or maybe irritated, annoyed, sad, disheartened or gloomy for no apparent reason? Some people have this effect on others and the more time you spend with them, the more they seem to drain you of your vital energy and positivity. People like these that make you feel dispirited and somehow seem to feed on your mental energy and ensuing emotions are actually toxic people, also known as energy vampires. They use a variety of psychological manipulation tactics to undermine you in various aspects of your life and feed off of your mental energy and emotions. 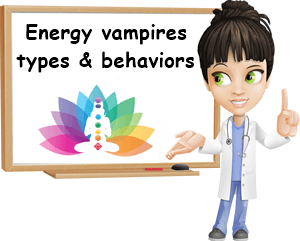 Most of the victims of these energy vampires often notice the negative, emotionally and mentally draining effect these types of people have on them, yet refrain from action. This is because the manipulation is so insidious that it causes you to question yourself, your decisions, other people’s intentions towards you, your goals in life, happiness and successes. This is so you focus so much on the effects of the manipulation that you don’t look for the culprit elsewhere and they can keep up their psychological manipulation. It often takes more than one experience with toxic people or energy vampires to learn to recognize them and take action against them by breaking off contact. Defending yourself against them is also difficult especially when some of the people closest to you are the ones manipulating and putting you down. Toxic people are most commonly found within family ranks: a spouse, mother, father, sibling, child, mother-in-law, father-in-law, other relatives with whom you may have a close connection can manipulate you extensively. Romantic partners, friends, work colleagues or bosses are the next in line when it comes to potential toxic people. And behaviors and tactics may also vary. 1) Selfishness. Toxic people and energy vampires are selfish. They only look out for their best interest, although they may occasionally and briefly feign yours. They talk only about themselves, their aspirations in life, beliefs, experiences, notable acquaintances, passions etc. They always put their needs first, think only about how something will affect them, expect for everyone to make decisions with them in mind and emphasize their worries, dissatisfaction, wants while completely disregarding other people. If you even try to talk, they instantly get bored and sometimes don’t even try to hide it, so you feel bad and the conversation reverts to them. They may talk over you, laugh at you, belittle you, everything to make you stop talking about yourself. 2) Narcissism: they are simply the best. Someone who thinks they are the best at everything is someone you should beware off. They only hold themselves in high regard. What they do is always interesting, innovative, the right thing to do, fun, you name it and expect you to feel the same and praise them all the time. The worst part is these types of people can be magnetic and it is this charm that they use to entangle you. However, they are not capable of empathy and cannot sustain healthy relationships of any kind. Whatever the context, they want to and will do everything in their power to shine and outshine everyone else, including you. No matter the expense. They generally don’t see you as an equal, don’t respect you, ignore you, make decisions without considering your needs and can become excessively assertive or intimidating. 3) Controlling. Toxic people are often controlling. They may start off sweet and charming, but once they feel they have a good grip on you, they will attempt to control every aspect of your life. They will attempt to isolate you to better control you and this may include tactics such as keeping you away from your family, not letting you go out alone, deciding certain friends are not good for you and demanding you break off contact permanently, learning you schedule and demanding to know your every move. 4) Gravitation towards drama and conflict. Some toxic people are prone to drama and conflicts seem to follow them everywhere. They feed off of negative emotions, especially despair, hopelessness, heartbreak, sadness etc. The conflicts can be their own product or not even real, but they will treat them as something of great importance and revolve all of their attention around them, involving as many people as possible. They might not necessarily victimize themselves, but instead gossip and overall disrupt calm, inviting, non-judgemental environments with constant drama. 5) The eternal victim behavior. This type of toxic person sees themselves as a victim in all circumstances. It is a similar behavior trait to drama and conflict-seeking types, but in this case, all the attention is directed inwards. People like them feel persecuted by everybody, feel mistreated and attacked by innocuous comments or gestures and nothing is every their fault. There is always a reason for them to complain and they always wallow in self-pity. Their eternal complaining is emotionally and mentally draining because of the neverending negativity, constant need for approval and refusal to look for solutions to their dissatisfaction. They portray themselves as utterly dependent on you for sympathy and manipulate you emotionally by making you feel guilty if you are not always there to hear them out. 6) Overwhelming critics. When someone is always criticizing you, it becomes incredibly overwhelming. Toxic people often do this in order to break your confidence and better control you. Examples: a superior at work that never tells you you’ve done a good job, but always looks for flaws in your work. A friend that tells you that you look beautiful, but then points out that you looked better with an old haircut, another hair color, outfit or that you looked better before losing all that weight. Nothing is perfect, but there is no need for someone to point out every little flaw all the time, unless they are actively trying to undermine your confidence. Their purpose is to make you doubt yourself and at the same time be more open to their influence. And they don’t have your best interest at heart. 7) In a hurry to know you. Some toxic people can be recognized by the fact that they are always in a hurry and want to know absolutely everything about you as soon as possible. It’s important you see the real reason behind why someone might want to rush things because it’s usually not an honest motivation. For example, a business contractor might want to close a deal fast before you find out their company is in debt or has other problems. A person might show a sudden and excessive interest in you so they gain all the information they need to control you. Usually, when someone wants to know everything about you but doesn’t tell you almost anything about them, their motives are not sincere. 8) Evasiveness. Some types of toxic people never answer a question directly, they don’t reveal much about themselves, fail to show up, reprogram dates and make a big deal of the reasons why they couldn’t meet you when they said they would. You don’t know their schedule, friends, address, job or really anything for sure. They may be charming, but they cannot be trusted. 1) Selfish people. Break off contact or limit it considerably. Make time for yourself and consciously put yourself first. Show them you have a strong character by prioritizing yourself. They will slowly lose interest in you. 2) Narcissistic people. Avoid them, limit contact or maintain what is a highly superficial relationship (for example, an occasional exchange of pleasantries with a colleague at work). They cannot sustain any healthy relationship, especially not a long-term one. 3) Controlling people. Avoid them. If you are in such a relationship, stand up for yourself, make your situation known to friends and family, ask for their support and contact the authorities if necessary. The more grip such a person has on you, the more they will feel entitled to control you. 4) Drama and conflict-prone toxic people. Feign lack of interest in gossip. Avoid conversations revolving around other people’s unpleasant situations. Be supportive, non-judgemental, kind, the exact opposite of what this type of person is looking for to perpetuate drama. 5) The victim or martyr. They are some of the biggest energy draining people and there is really no other way to defend yourself than to break off contact. Gently and swiftly end conversations by telling them you have important things to attend to. 6) The critic. If someone if overly critical of you, your work, appearance, decisions, then you must learn to not ask for their opinions (although they will surely give them to you) or value them less by understanding there is an ulterior motive behind all this far-fetched negativity. At work, either look for another superior to give you real feedback or simply give yourself credit knowing you are doing everything you can to become better at your job (on the same topic: What is wrong with me?). 7) Wants to get to know everything about you fast. Pay close attention at what details these people seem most interested in, analyze what they reveal about themselves to see if they actually provide you with real information and be weary of people who want to know all you secrets. 8) The evasive person. Break off contact immediately with a person who is reluctant to tell you who they really are, is evasive with their plans, has to reprogram meeting you all the time or shows other similar signs of mistrust. No good can come out of it. Conclusion. Toxic people undermine your confidence to such an extent they make you think there is something wrong with you. This allows them to deflect the attention off themselves and continue to manipulate you. Their actions often stem from envy, insecurities, emotional problems, but are also driven by narcissism, desire to have fun and financial gain. Toxic people are also often highly intelligent and most will know or somehow sense they if they can or can’t manipulate you. This is why it is important to learn to recognize unhealthy behaviors in those close to you and defend yourself from psychological manipulation, whether intentional or not.